Office 365 is a cloud-based service designed to help organization’s meet their needs for robust security, reliability, and user productivity to help save time and money. When organizations move to a cloud service, they must be able to trust their service provider with their most important, sensitive, and confidential data. Hear how bundling an Office 365 solution with Trend Micro and Acronis provides a complete and comprehensive solution for your customers while building year over year recurring revenue for your business. 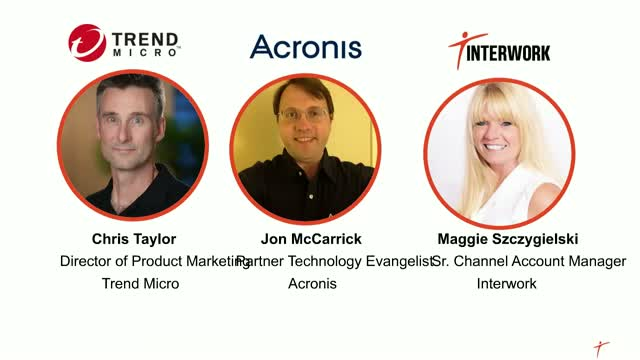 Join our webinar and let’s discuss how partnering with Trend Micro and Acronis will transform your business with easy to deploy, manage, and sell security solutions. •Learn how Trend Micro’s Cloud App Security enhances Office 365 security to detect advanced threats including unknown malware, ransomware, and malicious URLs. •Learn how Acronis provides Backup solutions needed for Office 365 email eliminating operational overhead, streamlining backup sales, and meeting data protection regulatory requirements. As you take advantage of the operational and economic benefits of virtualization and the cloud, you need to demonstrate that you can strategize and implement an approach to security that matches the agility and performance they are seeking across their environments, all the while protecting them from increasingly sophisticated attacks like WannaCry, Erebus, and Petya. An ESG Interview with Steve Duncan, Trend Micro's Product Marketing Manager, on Endpoint Detection and Response (EDR). Whether we are talking about the traditional desktop, laptop, or mobile device, the endpoint is always the target of cybercriminal activity. Advanced endpoint protection (AEP) is a disruptive new technology that focuses on preventing cybercriminals from ever reaching or executing on the endpoint. AEP products employ sophisticated techniques such as machine learning, pattern recognition, or predictive algorithms to detect and block malware and to contain suspicious activities. NSS Labs recently announced the results of the highly anticipated Advanced Endpoint Protection (AEP) 2.0 Group Test. This year’s test included 20 of the industry’s leading AEP vendors to measure how well each of their products could detect, prevent, and log threats accurately, while remaining resistant to false positives. In addition to security effectiveness, each product was scored according to its total cost of ownership so that enterprises can understand each AEP product's overall value. Tune into this webinar to learn how Trend Micro performed in NSS Labs' AEP 2.0 Group Test. The Endpoint Is Not The Battleground - We have seen extensive growth in protection capabilities at the endpoint but is that enough? In this webinar, we will discuss the terminology of “next generation” and explore true end-to-end threat intelligence, and how machine learning is applicable. - Two case studies of Office 365 E3 and E5 customers who scrutinized their email and files for phishing, ransomware, and Business Email Compromise attacks. Your users are a key source of risk in your organization – they want to work where and how they want. How do you ensure that your corporate information is free from prying eyes and that your users aren’t creating gaps in your security? Trend Micro User Protection, an XGen™ security solution, protects your users against today’s ever-changing threats like fileless malware, targeted attacks, and ransomware variants, including WannaCry. Multiple integrated layers of protection across endpoint, email, web and SaaS applications, protect your users regardless of device, application, network, or location. Go beyond next-gen with XGen™ security, a new class of security software that addresses the full range of ever-changing threats—now and in the future. Instead of using separate, siloed security solutions that don’t share information, XGen™ security provides a cross-generational blend of threat defense techniques and a connected threat defense that can protect your organization from unseen threats. Global leader in security software and solutions. Trend Micro develops security solutions for businesses and consumers to exchange digital information. With 30 years of security expertise, we’re recognized as the market leader in server security, cloud security and small business content security.